What makes Harrison’s the choice for corporate moves? Harrison’s Sales Representatives work closely with you on all facets of pre-move planning, your actual move-day and follow-up & service after the move. They perform the role of project managers to ensure that your entire move runs smoothly and according to your plan. At Harrison Moving, we arrive on time and we finish on schedule. Harrison’s uses only our own, full-time, highly trained employees, and full service movers. Harrison’s Provides Flexibility and Control Planning. The logistics of a move can be a complicated process that requires coordination between external services such as telephones, electricity, utilities, and government agencies. Add to that your specific business considerations and staff needs and the job of moving can become overwhelming. At Harrison’s, we have the flexibility of size, staff and equipment to be responsive to your unique moving requirements. At Harrison’s, you get a single point of contact for all your coordination needs. Harrison’s owns all our own trucks and equipment. Harrison’s employs a large staff of full-time, professionally trained commercial movers. We take great care to minimize the risk of damage to your office space by preparing your facility with protective padding and coverings. Harrison’s covers and protects any and all sensitive flooring surfaces with protection. Carpeting is protected to prevent any dirt and stain damage. Walls, doors, door jambs, and elevators are all thoroughly protected against the possibility of dings or nicks. Electronic carts for expert handling of computer components & electronic. Library carts for file systems and shelved items. 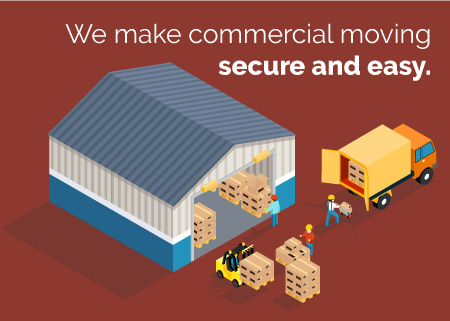 Experience in moving safes, secure & fire-proof. Legal totes for packing files. Cartons for packing desk items. Color coded and cataloged inventory.